Mineral Sheer Matte Bronzer 0.35 oz. Sheer matte bronzer that helps to control shine and gives skin a healthy sun kissed glow. Mineral oil free, talc free, dye free, paraben free. Refillable compact included. Mineral Sheer Bronzer 0.35 oz. Sheer bronzer with silk like texture gives skin a natural bronzed finish. Mineral oil free, talc free, dye free, paraben free. Refillable compact included. Soft Focus Face Powder 0.45 oz. Evens skin tone diminishes imperfections for flawless looking skin. Paraben free, gluten free, Passover approved, hypoallergenic, dermatologist tested. Compact sold separately. Contour Powder Duo 0.46 oz. Highlight and contour all in one compact. Smooth satin finish. All skin types. Paraben free. Compact sold separately. Baked Hydrating Powder 0.37 oz. Hydrates and helps to even out skin tone and diminish imperfections for a flawless radiant finish. Light coverage. All skin types. Paraben free. Refillable compact included. 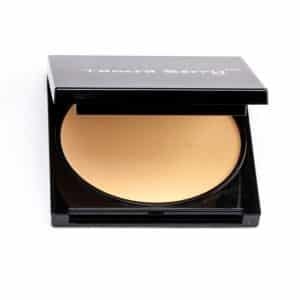 Luminous Foundation Broad Spectrum SPF 15 1 fl. oz. Lightweight light-diffusing foundation that gives skin youthful, luminous, flawless finish. Natural coverage. All skin types. Hypoallergenic, oil free, paraben free. Mineral Liquid Powder Broad Spectrum SPF 15 1 fl. oz. Perfects and protects. Soft powder finish. Medium to full coverage. All skin types. Hypoallergenic, talc free, wax free, dye free, fragrance free, paraben free. Baked Finishing Powder 0.37 oz. Sheer powder that helps to control shine and gives skin a subtle radiant glow. Paraben free. Refillable compact included. Holds shadow in place for all day long wear, keeps shadows color true. Transparent. Locks shadow in place for all day crease free wear. Hypoallergenic, kosher, gluten free, paraben free. Tinted Primer Broad Spectrum SPF 20 1.20 fl. oz. Hydrates, protects, evens out skin tone with luminous flawless finish. All skin types. Hypoallergenic, oil free, fragrance free, paraben free. Pore Perfecting Face Primer 1 oz. Oil free, lightweight, reduces appearance of pores, absorbs oil and combats shine. Normal to oily skin types. Oil free. Paraben free. Retexturizing Face Primer Broad Spectrum SPF 20 1 oz.